Under the guidance of its membership, the National Council of State Boards of Nursing, Inc. (NCSBN®) develops and administers two national nurse licensure examinations; the National Council Licensure Examination for Registered Nurses (NCLEX-RN®) and the National Council Licensure Examination for Practical Nurses (NCLEX-PN®). These two examinations are used by the Boards of Nursing to test entry-level nursing competence of candidates for licensure as Registered Nurses and as Licensed Practical/Vocational Nurses. The NCLEX examinations are provided exclusively as computerized adaptive tests. Test Plan was approved at the NCSBN Delegate Assembly in August 2010 and was posted on the NCSBN website, www.ncsbn.org /1287.htm, shortly thereafter. This new test plan goes into effect on April 1, 2011. The format of the test plan was retained and only minor edits were made for currency and clarification. The fee for taking the NCLEX examination is $200. You will also have to pay other licensure fees required by the board of nursing in the jurisdiction in which you are applying. If you choose to schedule your NCLEX examination at a test center outside of the U.S.*, you will have to pay an additional international scheduling fee of $150, and where applicable, a Value Added Tax (VAT). After registering, candidates who want to change the board of nursing where licensure was requested or the type of examination requested (RN/PN) will be required to pay a $50 change fee. For more information about fees and policies go to www.ncsbn.org/nclex.htm. There will be no refund of registration fees (mail, telephone, or via the Internet) for any reason. This edition and its previous editions were well written. The authors, Linda Q. Thede and Jeanne P. Sewel, write this book in a simple and easy to understand. 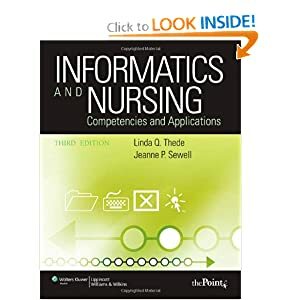 All nurses should understand the competencies and applications in Informatics and Nursing, I found that this book is a quick and easy way to investigate on it, it is Informatics Basics, Computers and Your Professional Career, Information Competency and The New Healthcare Paradigm. There is also a chapter in Healthcare Informatics and Computer Uses in Healthcare Beyond Clinical Informatics, to help us understand the latest issue in nursing informatics. It’s important that all nurses who willing to deliver the best services through the touch of technology to understand nursing informatics comprehensively. It’s never too late to buy an informative book, and here I recommend this book to ALL, professional or not. Highly recommended! Good luck all future nurses! 3Department of Nursing, Missouri Western State University, U.S.A. Nursing Leadership is a great concern among health personnel and nursing service personnel. Nurses lead and manage nursing care for patients, families, aggregates, and communities in a variety of settings, ranging from ambulatory, community, to hospital. Nurses also lead and manage care across the health-care continuum, including primary: health promotion and prevention; secondary: skilled, long term, and rehabilitative care; and tertiary: emergent, urgent, and acute care. Developing future nurse leaders in Indonesia is one of the greatest challenges faced by the nursing profession. This paper focuses on the basic concept of nursing leadership and the present and future leadership movement of Indonesian nurses. A clear understanding of these issues is critical to face tomorrow challenges within organizational context.